2012 – The Year of Many Milestones! I am BURSTING with excitement today! This year has been an AMAZING ride. I celebrated a milestone birthday in March (40!!!). One week and 2 days ago I submitted my final paper for my MBA – FIVE YEARS in the making! 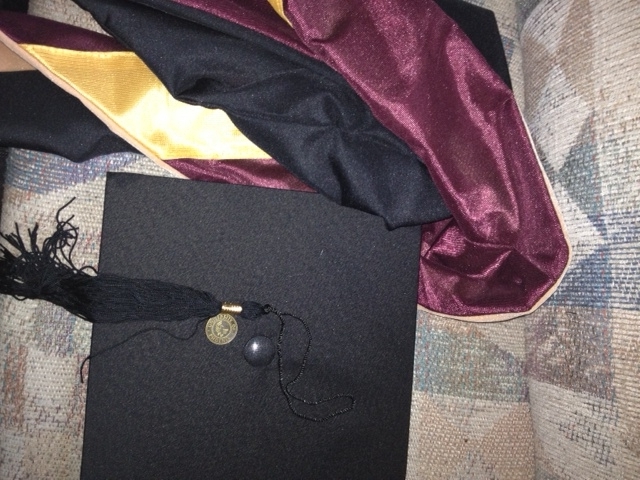 ….and in the mail, my regalia for my MBA graduation later this year! What will happen next? I don’t know, but I am giddy with excitement! I sense that God is reminding me that all the years of hard work, dedication, determination and sacrifice are about to help me “hit the jackpot!” When we are faithful to God, He will be faithful to us. He has never failed us. Although all these exciting things are happening, just like everyone else I have areas in my life that I wish I could change right now. But I am not as panicked as I was a couple days ago. My discouragement is waning and fading. He is sending me help because He knows what my needs are before I even mention them, and that is some “blessed assurance” RIGHT THERE! Thank You God, for helping me to get here. A single mom, a divorcee, celibate and sold out to You and to Your purpose, preparing for what’s next, I humbly bow to You and acknowledge the significant role You’ve played in my life up to this moment. I know that more is in store, and that You won’t leave me nor forsake me. THANK YOU for life, health, strength and peace in the midst of chaos and distractions. You have surrounded me with wonderful people. Thank You God for supportive friends, family, coworkers and others. Thank You FOR everything, DESPITE everything! I am in awe of who You are and of ALL You have done, all You are doing, and WILL DO! Michelle, many miles away, you are definitely an inspiration to me! Congratulations and there is more in store! Abundant Life is beginning for you! Thank you ma’am! You have encouraged me as well with your recent graduation with a degree! It’s my desire to encourage and inspire as many people as possible. I am truly thankful for all that God has done for me. I couldn’t have done any of it without His help. Michelle – You are an amazing woman! Your transparency helps so many, more than you will ever know. We need more leaders like you who will “share their stories” for the purpose of helping others. You have invested much, stepped out on faith and as you say “been faithful.” I also love your ability to encourage yourself. Keep on reminding yourself of God’s promises. And I agree with you, your harvest of best days are right in front of you! I am truly proud of you!